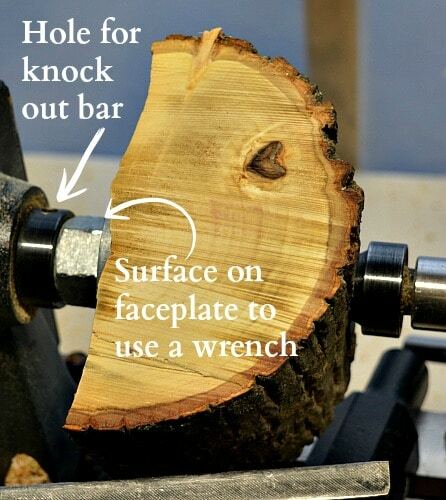 How to secure wood to your lathe using the tail stock or a face plate. In order to turn wood on a lathe you have to secure the wood to the lathe. For spindle turning the wood is held between the head stock and the tail stock. For bowl turning I will show you how to mount a bowl blank with a face plate. 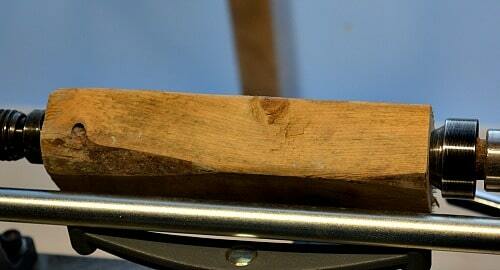 These two methods lets the lathe spin the wood which then allows you to turn and shape the wood with your tools. That’s the fun part. Once you have done a bit of turning this process becomes second nature. However you always want to remember to safely secure the wood to your lathe. Wood flying off of the lathe is the primary cause of serious injury for woodturners. Prepare your blanks. Get them reasonably round or square. On square blanks mark the center by drawing a pencil line from opposite corners. The intersection is your spot to mark. 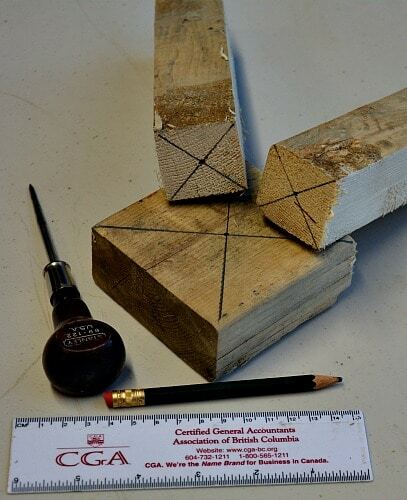 Use an awl or sharp point to make a dimple at the intersection. Move your tool rest close to the head stock and make sure the tool rest is out of the way of where the spindle will be mounted. Mount your tail stock on the lathe. Your tail stock is adjustable and there is a lever that tightens and releases your tail stock. Make sure your tail stock is movable. Move it to about the right place for the length of your turning blank. The image below shows you the details of the tail stock. This is the reverse view because the levers to lock the tail stock and quill in place are on the far side of my mini-lathe. Use the image as a reference for the following instructions. Line the dimples up with the drive spur and the live center. This is more awkward to say in words that it is to do. Put one end of your turning blank against the headstock. Line up the dimple with the center of the head stock. You may have to move the tail stock back to get your blank in position on the lathe. Move the tail stock so that it is close to your turning blank. You can actually touch the turning blank at this point if you want to. Lock your tail stock in place. Line up the dimple with the point of the live center. 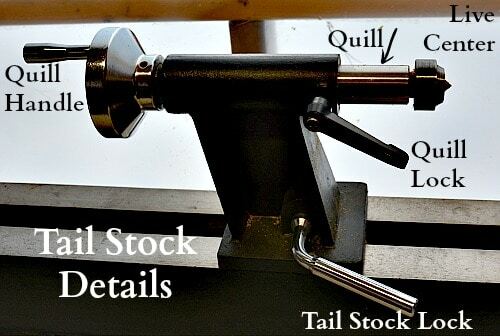 Turn the handle so that the quill advances out of the tail stock towards the head stock. This will move the live center into the blank. Advance the quill to tighten the two points into the turning blank. There is a locking screw on the quill. Tighten this to hold the quill in place as you are turning. You will have to unlock this if you need to adjust your quill during your turning. Rotate the blank that is now held between the head stock and the tail stock. It should be held securely in position and turn freely. Move the tool rest up to the blank. Adjust the tool rest to be at the mid point of the blank (or a little higher or lower depending on your turning preferences). Again rotate the blank to make sure you don’t stick on the tool rest. Stand clear of your lathe and turn it on. While spindle turning is generally done at a higher speed than bowl turning if you are turning a large spindle then start with a lower speed. Use your roughing gouge to turn your spindle round. 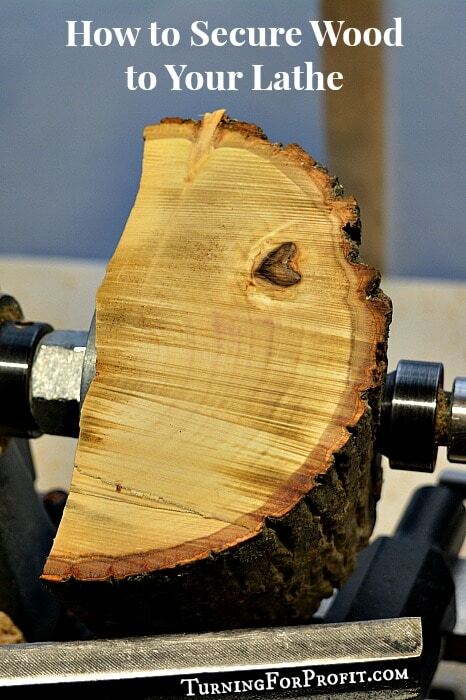 If you have some catches or are taking heavy cuts you might find your turning blank loosening. 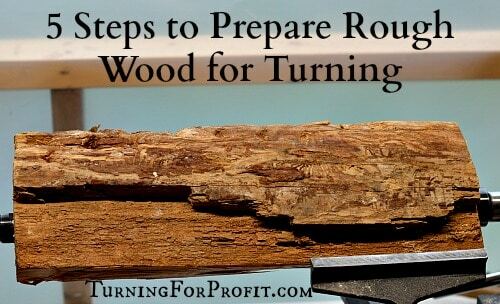 This can sometimes happen if the drive spur wears away the wood and no longer catches the wood enough to turn it. When this happens the blank will stop turning when you try to take a cut. Turn off the lathe. Loosen the locking screw on the quill. Advance the quill towards the head stock. Check that the blank is secure. Lock the quill in position. Turn on the lathe and keep turning. The other challenge is not to over tighten the quill. I know, it is holding the spindle on the lathe! However the thinner the spindle gets, like an oatmeal spurtle, the more likely the extra pressure will bend the spindle and make it impossible to turn a round spindle. Generally if the project is turned in one session and you don’t over tighten the quill you should be okay. It is a challenge if you take the spindle off of the lathe and now you are remounting it. Take your time adjusting the spindle bland to ensure it is in place and it is not being bent by excessive pressure. 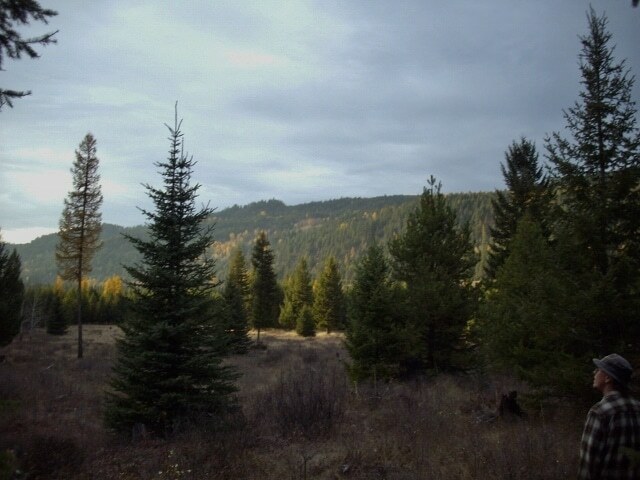 A bowl blank can be a square turning blank or a blank taken from a log. You should have a flat surface to attach your face plate to the blank. Bowls, because they have larger diameters than most spindles, have a higher centrifugal force on the lathe. That is, they want to leave the lathe if they are not securely held in place. If you can trim the corners of your blank to make it fairly round. A badly out of round blank can bounce a heavy lathe around the room! Estimate the middle of your blank and use that mark to center your face plate. Use wood screws to attach the face plate to your blank. Holding the blank in place is more important than saving some wood. 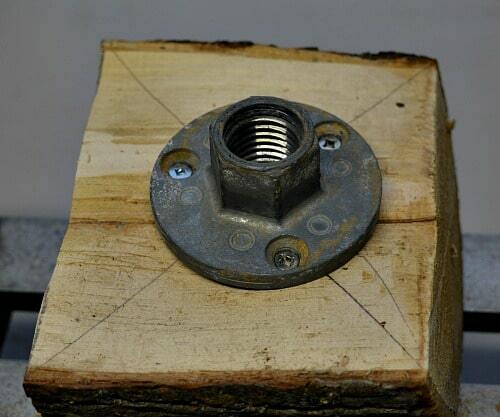 Wood screws have the screw threads farther apart which helps the screw hold the wood. Try to line up the holes on the face plate so that you are not putting two screws in a line with the grain of the wood. A 3 ½” face plate has the screws fairly close together. If they are on the same line of the grain you could end up splitting the wood and losing your bowl blank when it is on the lathe. To take the face plate off of the lathe you insert your knock out bar in the hole on the drive shaft. Put the wrench on the face plate and move them in the opposite direction to loosen. 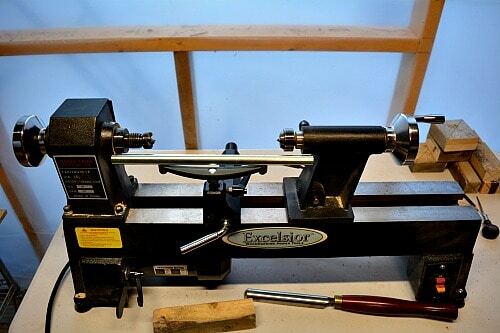 Just because you are turning a bowl does not mean that you take the tail stock off of your lathe. In turning the outside of a rough bowl the extra support of the tail stock will keep you blank where it is supposed to be. On the lathe! The above image shows the tail stock moved in for extra support. After the bowl blank is mounted slide your tail stock up to the blank. 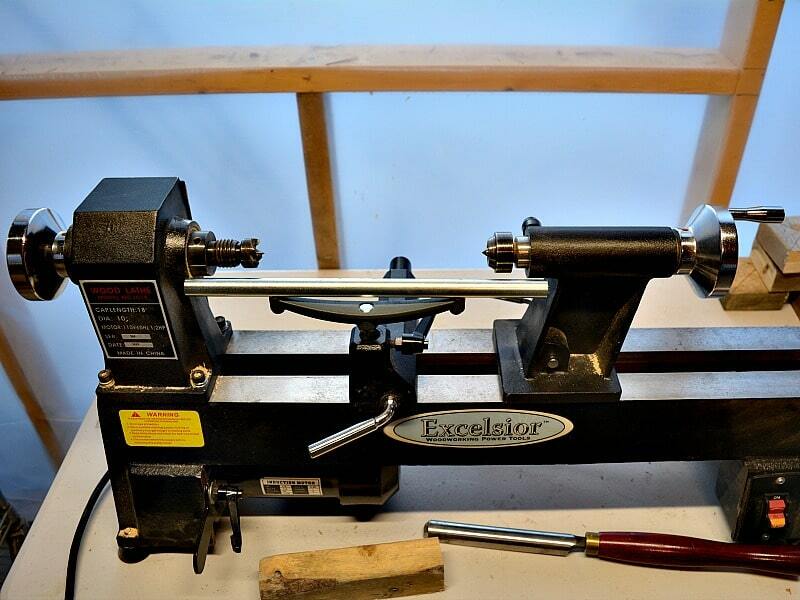 If you need more room for your tool rest you can extend the quill of the lathe which will move the base of the tail stock from your bowl blank. Make sure the tail stock is locked down, the quill is advanced, and the quill is then locked in place. Now you are good to go. 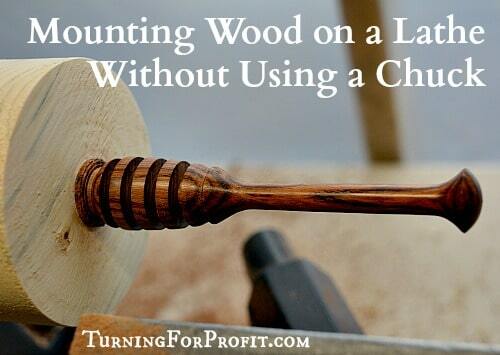 Use a bowl gouge to turn your bowl blank round. With a bowl blank rotating in the lathe, and the grain is perpendicular to the lathe (at right angles) then you will be cutting end grain twice on every revolution of your blank. Your bowl gouge is designed to withstand the forces that cutting against the grain will produce. So do not use your Spindle Roughing Gouge. There is a reason that Spindle is in the name. That is what it should be used for. Be aware of the sound your lathe makes. It will be slightly different between spindle turning and bowl turning. 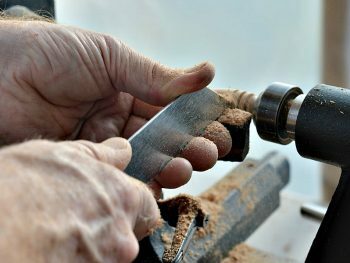 Frequently a change in the sound of the lathe, or the wood, or the cut that I’m making, will alert me to a problem with my turning blank. I have tightened a few bowls back onto the lathe because I heard a change in the sound the cut was making. If you hear a sound you are not expecting then shut off your lathe and check it over to make sure nothing has come loose. Once everything is secure you can go back to your turning. Here are some safety tips for your woodturning. Keeping the wood on the lathe is good for 2 reasons. Firstly it keeps you safe, and that is important. 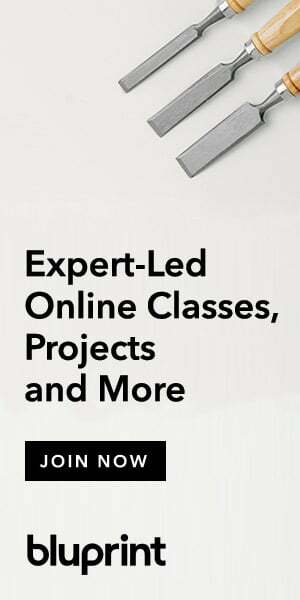 Secondly you are able to complete your projects. I’ve had a few spindles and bowls that made unexpected trips away from the lathe and the results were not pretty. So safety is important and for turning that includes keeping the wood on the lathe. 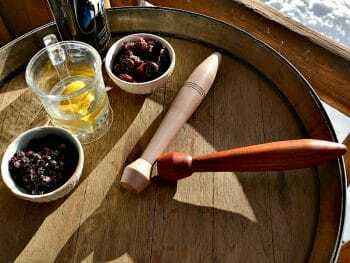 These posts are for you, the woodturner. 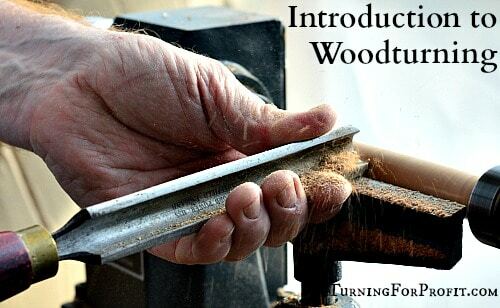 If you are just starting out on your woodturning adventure then An Introduction to Woodturning could be helpful. 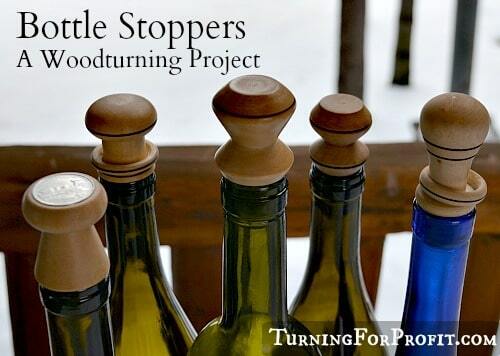 Some easy spindle turning projects are Christmas Trees, Wooden Icicles, and Honey Dippers. When you are learning to turn bowls then a Mason Jar Lid is a good project to introduce you to using your face plate. 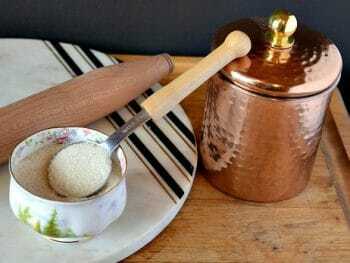 Follow that one up with a simple bowl or a small ring holder. I love wood turning and sharing with you. Thank you for joining me on this woodturning journey. Have fun and remember to turn safely.